Yes, I know that “blog” was born of “web” plus “log.” But that doesn’t make it right. It just makes it the ungainly child of two rather plain parents. 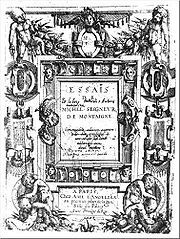 A brief historical digression: the 16th century French writer Michel de Montaigne created the modern essay (or Essai, as you can see in his title page above) from the French verb meaning “to try, attempt, have a go at something.” But what if instead of Essai, he had chosen to call it a Schtrumpfwaffel or Shplaff or Dreck? Maybe high school students across the world today wouldn’t be writing essays in order to get into college. They’d be procrastinating on their shplaffs, or else inscribing magical spells on birch bark. So, in the dubious name of progress, I’d like to propose some alternatives. Hopefully you’ll have some even better ideas. live + journal vejournal vegernal, something either anatomical or vegan-related, or both. journal + vif journavi journey, bonjovi, other rock bands from the ’70s and ’80s. how about advertising? I mean is that not what we do when we blog? or Web penning? Or Web Pen hey wait how about Webeese? Now how about: burogu? Japanese for “blog”, but all those extra vowels (and r instead of l) makes it sound so more melodious. We’ve all pretty much gotten used to “blog” and “blogger.” And variations like blogoaholic and splogger. It’s like the layout of the keyboard. Maybe Q doesn’t need to be above A but good luck changing it getting people to adapt! Anyway there’s like books about blogging. So it’s pretty much set in stone. Or wood pulp. Speaking of wood pulp. Monkey tea? Sounds like some dirty water in which the monkeys have been soaking. Yum!